If you're a new dog owner, you've probably seen your dog suffer from something you think are hiccups. However, you're not be sure that's the case. Naturally, you ask yourself...can dogs really get hiccups? Read our text and find out if you're right! Hiccups can be so annoying, right? You try everything, from holding your breath to drinking some water, or even making someone scare you. But the bottom line is that you know it’s not dangerous and that it’ll eventually pass. But what’s the case with dogs? Do they get hiccups the same way we do? The simple answer to this question is – yes! Dogs get hiccups. Check out this video and see for yourself! Every dog owner has experienced the hiccups with their dog. Like with us humans, hiccups aren’t unusual at all, and it is especially frequent with puppies. Some dogs have it more often than others, but in most cases it’s completely normal and harmless. First, let’s explain what happens in the body due to hiccups. The hiccups, for dogs, as for us humans, represent a contraction of the diaphragm. This muscle separates the abdomen from the chest and allows lungs to fill with air. When muscles that control the diaphragm involuntary contract, this phenomenon called the hiccup occurs. Since it is connected to some nerves in the dog’s throat, a sound comes out every time the diaphragm has a spasm. As we already mentioned, hiccups are in most cases completely normal and the most frequent with puppies. Scroll down and find out why that’s the case! Why are hiccups more common with puppies? We don’t really know why puppies get hiccups, but some say that it’s because they’re nervous or hungry. We’ll go more into details regarding specific problems further down in the text. Some veterinarians believe that they are a kind of exercise that dogs do for their lungs. This presumption is strengthened by the fact that puppies get hiccups before they even are bored, in their mother’s womb. According to this theory, puppies will keep getting hiccups until their lungs adapt to the environmental conditions. This theory is likely to be true, as most dogs don’t get hiccups after they’re 1 year old. The first time you notice that your puppy has the hiccups, you might get worried as it has never happened before. Is it normal? Should I be worried? The answer is – yes, hiccups are normal and not uncommon! There is no need to be worried unless they last for a very long time or if they are just one of the symptoms of a syndrome. We’ve created a long list of various possibilities that can cause hiccups. Scroll down and check it out! In most cases, we don’t know what’s causing the hiccups and it is completely harmless. This is the case in 90% of the situations. Also, most dogs stop getting hiccups when they’re no longer puppies, so if you still have a puppy at home chances are big that hiccups may occur from time to time. Seeing this long list is probably overwhelming and a bit scary, we know! But there’s no need to panic when you reed all the different possibilities. Hiccups are usually normal and will pass before you know it! Don’t imagine the worst as soon as you see or hear that your dog has the hiccups. It’s probably nothing. Even if hiccups can be one of the symptoms of some of the problems mentioned above, it never is the only one! If your dog is healthy, plays, eat well, grows and experience hiccups from time to time, there is no reason for you to worry! For instance, when it comes to kidney failure, on top of the hiccups that might occur, the dog will be lethargic, anorexic, throw up regularly, need much more water… So, hiccups alone is not a reason to take your dog to the veterinarian. How do I know if my dog has the hiccups? Dog hiccups can sometimes be mistaken with sneezing or coughing. Even if it doesn’t seem so likely that you would confuse these three actions, it is in fact very possible when your puppy is still young and makes a lot of different, strange sounds. It is not uncommon to confuse hiccups with so called reverse sneezing. In order to separate these two read this article. What Do I Do If My Dog Has The Hiccups? At first, nothing! If your dog is healthy, the hiccups will stop naturally after a couple of minutes, or even seconds sometimes. In order to stop the hiccups if they last too long (which means longer than 2 hours) you have to, theoretically, stop the involuntary contractions of the diaphragm. Not easy to do considering that these contractions are not voluntary. Even though there aren’t any techniques scientifically proven, there are still some ways you can try when you want to stop the hiccups. As hiccups with dogs can be caused by stress or excitement and if your pet is a bit agitated during the hiccups, try calming him or her by slowly massaging its chest and take him to a calm, dark room. If these hiccups are frequent after your dog’s meal, it’s probably caused by eating too much or too fast. Try giving your dog smaller, but more frequent, meals. 3 or 4 times per day is good. A visit to the vet is in order if the hiccups don’t stop for more than 24 hours. And of course, if you notice other symptoms besides hiccups. The first thing you have to do is to state what is causing the hiccups. Different cause calls for different measure. The basic idea is to calm your dog due to hiccups, because irregular breathing will make stopping it impossible. It’s also very important that you stay calm. As you know, dogs are very good at sensing our emotions. If they feel that we’re agitated they will have a hard time calming down themselves. Just like with us, drinking a little water could help with hiccups. We often get the advice to hold our breath as well. However, this can’t be applied to dogs. If your dog is too greedy, you have to change its eating habits. You can either feed it less, from your hand or try to put a little water over its food. If your puppy is agitated try massaging its stomach. Slowly massaging the abdomen will make your dog relax and get rid of the contractions. An interesting exercise is putting your dog on its back, while you keep the front legs up. This should be done for a couple of minutes, and has proven effective. If your dog gets hiccups, distract him! Don’t let him or her just sit there and think about how annoying hiccups are. You can start playing a game or doing some exercise. Exercising is a great way to get rid of any spams. Try changing your dog’s breathing pattern. You can do this by giving it some food or something to chew on. Some foods are more likely than others to cause hiccups. If you realize that your dog gets hiccups after the same kind of food, it is most likely that this is the cause of the hiccup. Grains are one of ingredients causing hiccups, but it can be something else as well. Sometimes a perfectly healthy dog can’t stop hiccuping. In those cases your vet may prescribe chlorpromazine or haloperidol, in order to help the diaphragm relax. If hypothermia is the reason for hiccups, the natural thing is to help your dog warm up. Use your blanket or your own body heat until your dog gets back his normal body temperature. An interesting approach is giving your dog something sweet, like sugar, honey or maple syrup. There is no explication why, but this tends to work when you want to get rid of contractions. In very rare cases, surgery should be performed. This is after you and your vet have tried everything there is. The vet intervenes in this case on the dog’s phrenic nerve, which relaxes the diaphragm. 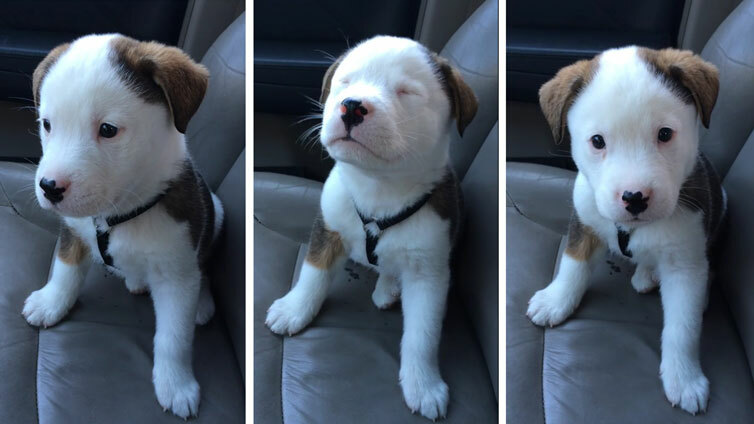 Yes, dogs do get hiccups, especially when they’re puppies. In most cases, hiccups are completely normal and a part of your dog growing up. However, in more rare situations, it could be a symptom of a more serious problem. Heart diseases, asthma, pancreatitis, gastrointestinal diseases and various respiratory diseases are some of these problems. If your dog gets hiccups, don’t panic, it will probably pass by itself. Only if it lasts for a long period of time or keeps reoccurring consult your vet and try to figure out what the cause is and what you can do to prevent this from happening.